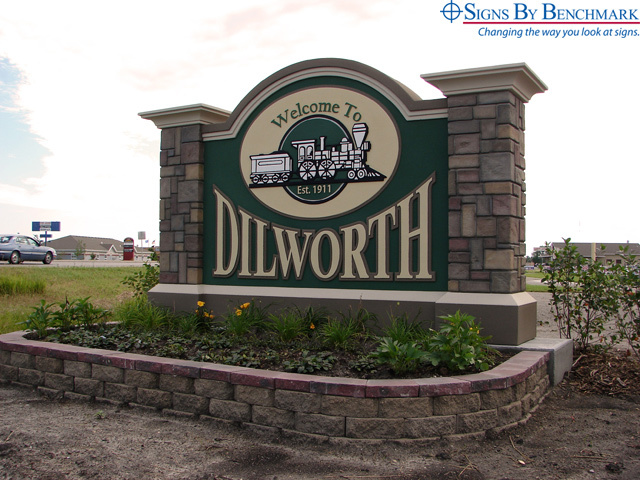 The Signs By Benchmark team has become expert at creating hand-crafted finishes such as faux stone for two custom monument signs manufactured for Brushmarks Signs of Detroit Lakes, Minnesota. 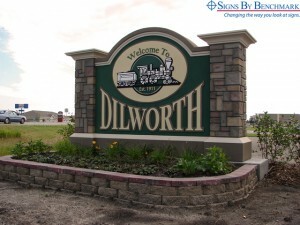 But the design offered another opportunity – the creation of an embossed logo for the community of Dilworth, Minnesota. Designed to enhance community entrances while welcoming visitors, the single-sided 8′ high x 12′ 9″ wide x 33″ deep signs present a stately, modern appearance. Faux stacked stone columns enclose the signs, showcasing the lettering and steam engine logo. CNC cut from cellular plastic (EPS expanded polystyrene), the letters and logo were coated directly into the sign face for strength and durability. The three-color stucco finish compliments the faux stone while achieving the “pop” factor that characterizes good signage. Give the team at Signs By Benchmark a call at 800-658-3444 to tell them about your upcoming projects. Design your own signage or ask our skilled designers for assistance. Either way, your customers will enjoy the end results.